The entire Universe is the “whole” created by the presence of yin and yang energies within the environment. This is the TAO that brings good feng shui and it reflects the optimal balance of chi that ebbs and flows according to the time of day and the changing of seasons. 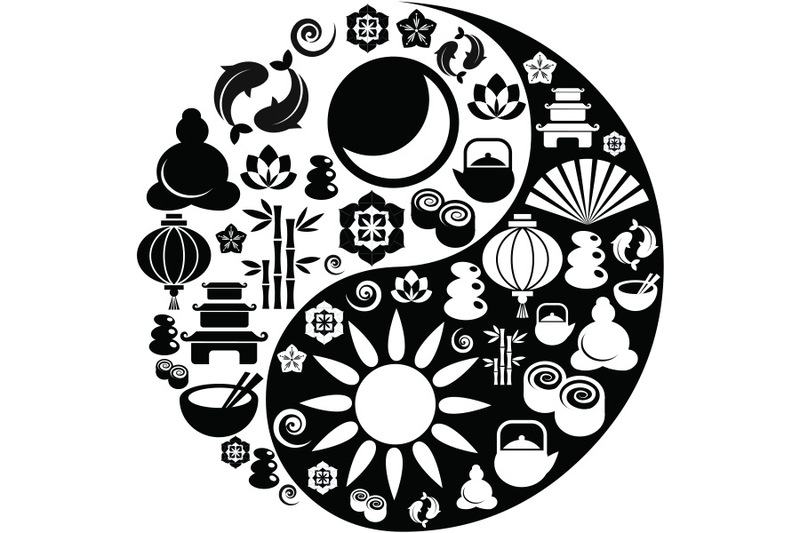 There is great depth in yin-yang cosmology and it goes beyond the polarity of opposites, offering in reality three dimensions to the polarities of both YIN and YANG. There is an outer, an inner and a most subtle secret YANG CHI, which brings continuity of good fortune. This is the YOUNG YANG that ensures a continuous supply of yang essence in the environment around us. Outer Yang essence is created by simply moving the chi, which we do daily without actually realizing it. The moment we move and spring into action when we wake up, we are creating Yang energy. Outer Yang is present when we move and we can enhance this by frequently moving the chi, changing the arrangement of furniture and the placement of the decorative objects displayed in our space. This regular change around of placements is what brings auspicious yang chi into the space. Inner Yang essence is generated when we create plenty of light energy, as this is what opens pathways for chi to flow and move around our abodes and our offices. Inner Yang essence bathes any space with clarity of thinking and clear-sightedness. 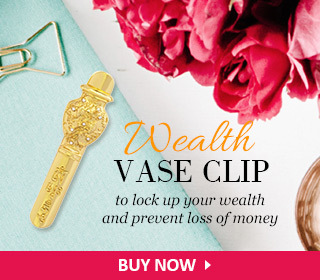 It brings good luck into the home and attracts good fortune that brings victory and attainments. Secret Yang essence is the very subtle and precious molecules of energy that permeate into the deepest recesses of space and also into the human body. This is the Yang essence that brings a magical and instant burst of joyousness that spreads through the environment. It expands and purifies the atmosphere, replacing all stale and stagnant energy with fresh, powerful and empowering energy. This is very precious yang chi and has to be created via a variety of means, one of which is by clapping. One way to generate Secret Yang essence is by clapping. When we clap, we create the sound of two hands beating, and this ignites the production and flow of secret yang chi energy that moves within the bodies of those doing the clapping. Those hearing the clapping will also feel their heartbeats get stimulated by the clapping action! 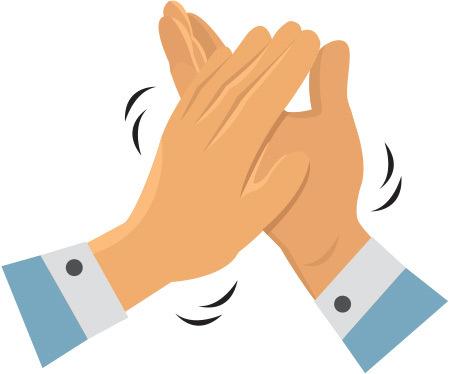 Clapping causes the body’s internal organs to get activated, immediately making the chi move, swirling outwards and upwards in a smooth flow of energy. Clapping creates powerful yang flows that add magic to the feng shui of space around us. It is thus worthwhile to learn how to clap comfortably while emitting a pleasant sound and rhythm. Everyone claps differently, so you can develop your own style. Just make sure you can clap painlessly yet emit sounds that are warm and rich and deep! The best way to clap is to do so by allowing the surface of the outer palms to touch in an almost embracing way, leaving the center of the palm to create the echo of sound. This gives your clapping a great deal of resonance and hence much greater power. Clapping brings magical good health to the environment and to our bodies. 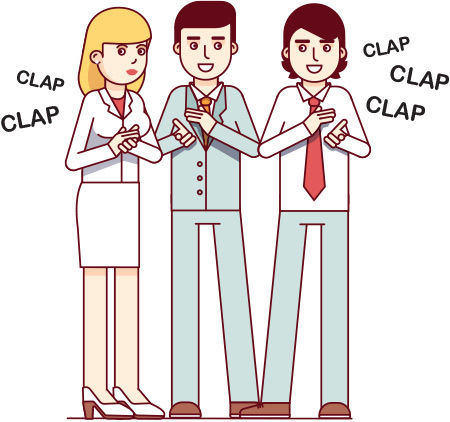 More than that, clapping actually generates the creation of magnetic forces that instantly saturate the atmosphere. This is yang essence that immediately dispels negative chi. Clapping chi can thus become effective for subduing everything that brings discord and disharmony. This way, clapping can be used in healing work, as the act of clapping bursts open all the pockets of negative chi, causing it to get dispelled. Clapping is the powerful ingredient in many incense rituals and prayer invocations. It features prominently in feng shui space cleansing. Indeed, simply walking round the rooms of your home clapping in a rhythm accompanied by a melody OR with the recitation of some special mantra you know such as Om mani padme hum is a powerful space-clearing ritual. This is often sufficient to cleanse your home or office space of discordant negative energy. This mantra calls on the Compassion Buddha and means Oh Jewel in the Lotus. It is a simple mantra, but it is powerful and when recited just under your breathe while your hands are loudly clapping; it creates a special vibration whose impact on your space, your room, and your home is very powerful indeed! CLAPPING FOR EXERCISE is also a great way to bring rhythms into our bodies. You do not know it, but simply adding clapping to any exercise you do multiplies the beneficial effect of the exercise a hundredfold. One of my favourite exercises is excellent for improving blood circulation, which is so helpful in living a healthy life. I do this by simply raising both hands above my head and clapping, then bringing the hands down to beat my thighs, one hand on each thigh. I do this for a total count of 36 times, because I am told there is something magical about the number 36 – it adds up to nine, it is 3 times 12, and it tires you just enough for the exercise to be beneficial without overtaxing the body. I am also told that it is clapping that makes all the difference, as here, the clapping of the five fingers stimulates all the end points of the capillaries; when the hands beat the thighs, it causes blood to get reactivated once more. You can also sit on a chair and clap to the left, to the right and upwards 36 times. 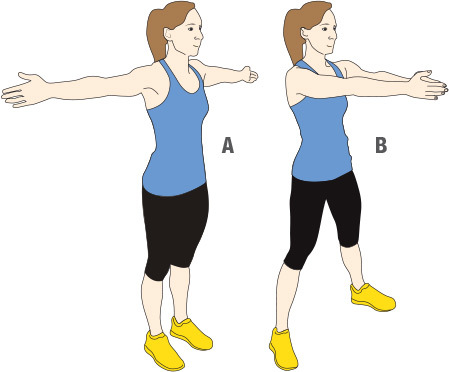 Do these exercises every morning to stay fit and active. Let the clapping stimulate your blood circulation and this will remove all obstructions in the veins and arteries. This is what can remove all the bad toxins in the body. It has also been scientifically proven that clapping is an effective way to cure m any human diseases. Clapping introduces an element of fun to the exercise. It brings out the child in us, making us feel younger than we are. In any case, note that there are 39 different acupressure points for almost all the organs in our body on our palms. It is little wonder that clapping is so beneficial to the health of the body. Clapping works slowly but very effectively! Clapping causes the body’s internal organs to get activated, immediately making the chi move, swirling outwards and upwards in a smooth flow of energy. Clapping creates powerful yang flows that add magic to the feng shui of space around us. The World Health Organization (WHO) confirms that clapping, simple as it is, is one of the best exercises for regaining good health. Some people have reportedly regained their good eyesight within six to twelve months just by clapping daily for about 30 minutes. 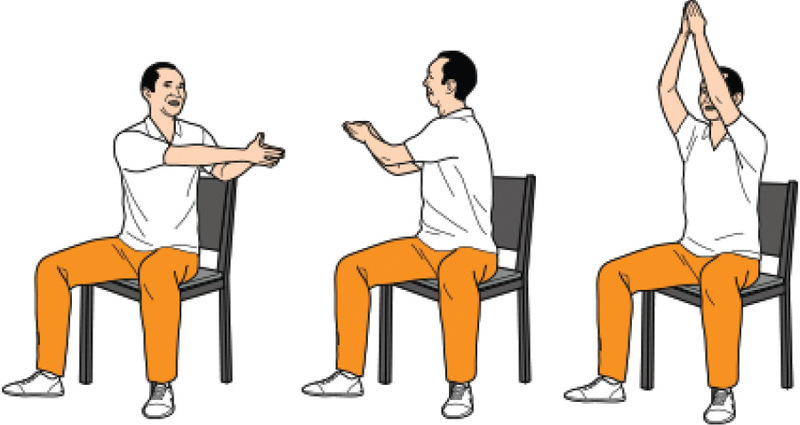 Stand as shown and stretch your hands in front of you, clap 36 times. Then place both palms over the eyes for a while. Let the warmth of your hands and fingers revitalize the eye socket area. SINGING TO CLAPPING is one of the most effective ways of creating a happy mood to any happy occasion. People clap while singing, dancing, appreciating good activities or are simply feeling good. Indeed, anytime you want to up the mood of any crowd, nothing works better than getting them to sing and clap. It is the clapping that gets the melody of the music to enter into the pores of people and to the atmosphere. It is the clapping that gets feet tapping and sets hearts beating. Next time you want to bring a burst of yang energy into your home, just start clapping to music and you will instantly feel the mood change, and no matter how yin the atmosphere, it will quickly lighten up. This is the power that comes from creating the molecules of yang chi. CLAPPING AS APPLAUSE. Putting our hands together in a show of appreciation is what we have learnt to do when we are moved by the excellence of some speech or performance. Clapping manifests applause and the more we are moved to awe and enthusiasm, the louder we clap. When we love how someone performed a piece, sang a song, gave a speech, we stand up, we put our hands together and we clap loudly and vigorously, and in so doing, we immediately release billions of molecules of yang vibrations that join with those formed by others who are also clapping. Clapping is contagious. It is uplifting! Applause clapping instantly creates an ambience of happiness. There are smiles and joyousness all round. Attend a sell-out concert or recital anytime you want to experience this kind of energy. It is lovely to bathe within the sound bytes of applause. The sense of joy spreads, as it is infectious. It is the best remedy for when you are feeling down and in need of yang strength to cope with some challenge. It cheers you like few things can. It is an instant fix. And yes of course it does not last long, but it does jumpstart your good feelings. How long this subtle yang chi stays with you depends on you! When you want to prolong the feeling of joyousness, just keep on clapping to rhythm, and as you walk and clap, whatever that may be negative in front of you will get dissolved and will dissipate. Clapping keeps you happy. Maintain it as your wonderful ultimate state of mind. Clap with the palms of your hands, repeatedly and in a rhythm you are comfortable with. You can clap to one, two, three or four beats, and by concentrating on the beats, you will be so caught up in the clap clap clapping of your hands in rhythm, you will have generated a body percussion that can truly lift your spirits as high as you wish. Clapping is used in many forms of music, in religious music, in dancing music and in singing music. Every kind of prayer or music sounds better when it incorporates clapping. It is clapping that sets the rhythm in place. And so, clapping has been an integral part of all the music of all the traditions of the world that has ever been created since time immemorial. Clapping is one of the easiest ways of improving the good feng shui energy of all homes, simply because it brings in the much-needed Young Yang chi energy. This is one of the most commonly used methods of the ancients that have come down to modern days; yet, despite it being such an obvious activity. 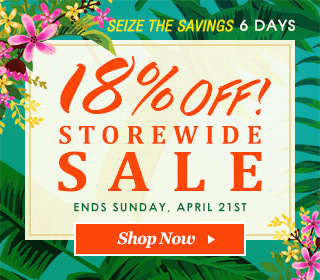 its good fortune benefits have stayed a truly well-kept secret.